The Doctor dead? Not on your life. 645 min. BBC. Directors: Toby Haynes, Richard Senior, Jeremy Webb, Richard Clark, Julian Simpson, Peter Hoar, Nick Hurran, Steve Hughes. Cast: Matt Smith, Karen Gillan, Arthur Darvill, Alex Kingston, Michael Gambon, Mark A. Sheppard, W. Morgan Sheppard, Hugh Bonneville, Frances Barber, Neve McIntosh, Catrin Stewart, Dan Starkey, David Walliams, Simon Callow, Ian McNeice (II), Mark Gatiss. Doctor Who in America? Yes, for the first time, Doctor Who shot principal photography in the United States—Utah to be more exact. Just the occasion for the Eleventh Doctor to remark, "Stetsons are cool," but also to play around with American culture and politics—Area 51, the 1969 moon landing, and Richard Nixon, to be more exact. The two-part season opener "The Impossible Astronaut"/"Day of the Moon" allows father and son W. Morgan Sheppard (Max Headroom) and Mark A. Sheppard (Battlestar Galactica) to play the same character at different ages, but more importantly it sets the parameters of a patented Steven Moffat mystery that will span the season: with new interstellar baddies the Silence waiting in the wings to threaten the Earth, we watch the 1103-year-old Doctor die at Lake Silencio...how can this be? Mysteries abound in Series Six, including the identity of Dr. River Song (Alex Kingston), revealed at the thrilling season midpoint, "A Good Man Goes to War." The episode also underlines the Doctor's ferocity and mythological infamy across the universe, in ways that productively darken the ostensibly good-natured character. Of course, the Doctor, Rory and Amy bound into plenty of genre-iffic adventures, including "The Curse of the Black Spot"—a seafaring adventure with pirates (including Hugh Bonneville) and a Siren (Lily Cole) that's evocative of classic Star Trek. The subsequent episode was a Really Big Deal for genre fans: Neil Gaiman's debut as a Doctor Who screenwriter, a tale dubbed "The Doctor's Wife" that significantly expands upon the series' mythology by exploring the true nature of the TARDIS and the time machine's personable relationship with the Doctor. Two-parter "The Rebel Flesh"/"The Almost People" introduces a new monster in the Gangers, dopplegangers produced by something called the Flesh. The possibilities of an episode called "Let's Kill Hitler" speak for themselves, while the creepy-doll chiller "Night Terrors"—penned by Mark Gatiss (Sherlock)—upholds the series' fine tradition of horror-flavored but kid-palatable episodes, another variation of which appears in the more existential horror of "The God Complex." Amy and Rory get a showcase in "The Girl Who Waited," and the season allows for a welcome return visit from the Doctor's bumbling Earth mate Craig (rising star James Corden) in the Cyberman story "Closing Time." The season culminates in the return of the Silence for the teasingly titled "The Wedding of River Song." Moffat pulls out the stops to resolve the season's central mystery, incorporating returning characters Charles Dickens (Simon Callow) and Winston Churchill (Ian McNeice) in the process of a wild alternate timeline that spells collapse for the universe (the episode also pays indirect homage to the recently departed Nicholas Courtney, the actor who played the Brigadier in the original series). Snappy special effects and snappier dialogue keep Series Six moving at a breathtaking clip. With fans already in love with the Eleventh Doctor, Amy and Rory, Moffat shows off confident control and gets fine work from a top notch stable of writers (I mean, c'mon, Neil Gaiman?). The Doctor dead? Not on your life. 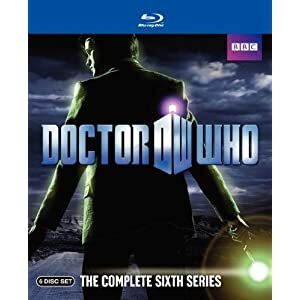 BBC Home Video resissues Doctor Who: The Complete Sixth Series as a part of the Doctor Who: Complete Series 1-7 Limited Edition Blu-ray Giftset. This new edition comes in a slimmed down Blu-ray case holding four discs (to the previous set's six), but more importantly, the A/V specs have been improved all around without losing a single one of the previously issued bonus features. Picture quality has bumped up from 1080i to 1080p, and audio quality from lossy DTS-HD High Resolution 5.1 surround mixes to lossless DTS-HD Master Audio 5.1 mixes. The results are outstanding, with already impressive A/V now promoted to definitive presentations. Disc One includes "A Christmas Carol," "The Impossible Astronaut" (with audio commentary by producer Marcus Wilson, line producer David Mason and actor Arthur Darvill), "Day of the Moon" and "The Curse of the Black Spot," as well as “Comic Relief Sketch ‘Space’” (3:58, HD), “Comic Relief Sketch ‘Time’” (3:03, HD), “'The Impossible Astronaut' Prequel” (1:43, HD), “'The Curse of the Black Spot' Prequel” (1:26, HD), and the Night and the Doctor featurettes (14:28 with "Play All" option, HD) “Bad Night” (3:40, HD), “Good Night” (4:53, HD), “First Night” (2:17, HD) and “Last Night” (3:34, HD). Disc Two serves up ""The Doctor's Wife" (with audio commentary by writer Neil Gaiman), "The Rebel Flesh" (with audio commentary by director Julian Simpson and actors Marshall Lancaster and Mark Bonnar), "The Almost People," "A Good Man Goes to War" (with audio commentary by actors Darvill and Neve McIntosh, and effects supervisor Tim Barter), and "Let's Kill Hitler." Also here are "Monster File – The Gangers" (13:02, HD), "Monster File – The Anti-Bodies" (9:04, HD), "'A Good Man Goes to War' Prequel" (1:38, HD), "'Let's Kill Hitler' Prequel" (1:57, HD). Disc Three includes "Night Terrors," "The Girl Who Waited," "The God Complex," "Closing Time," and "The Wedding of River Song" (with audio commentary by head writer/executive producer Stephen Moffat, director Jeremy Webb and actress Frances Barber) , as well as "Monster File – The Cybermats" (10:15, HD), "Episode 13 Prequel" (1:13, HD), "Night and The Doctor 'Up All Night'” (1:56, HD), "Part 1 Trailer" (1:08, SD) and "Part 2 Trailer" (:48, SD). Disc Four houses "A Christmas Carol Confidential" (56:04, HD), fourteen Series Six installments of Doctor Who Confidential— "Episode 1 – Coming to America" (14:18, HD), "Episode 2 – Breaking the Silence" (11:32, HD), "Episode 3 – Ship Ahoy!" (12:23, HD), "Episode 4 – Bigger on the Inside" (12:31, HD), "Episode 5 — Double Trouble" (14:22, HD), "Episode 6 – Take Two" (12:17, HD), "Episode 7 – The Born Identity" (9:19, HD), "Episode 8 – River Runs Wild" (12:59, HD), "Episode 9 – About a Boy" (13:50, HD), "Episode 10 – What Dreams May Come" (11:22, HD), "Episode 11 – Heartbreak Hotel" (9:17, HD), "Episode 12 – Open All Hours" (12:58, HD), "Episode 13 – When Time Froze" (9:12, HD)—and "The Nights’ Tale Confidential" (15:24, HD). For more details on these bonus features, see the below archived review of the previous Blu-ray set. 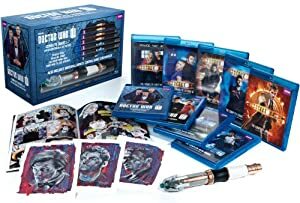 BBC Home Video sends Doctor Who: The Complete Sixth Series home in a spiffy Blu-ray special edition. The transfers are 1080i HD, and more than serviceable. Only the most discerning videophile will be able to note the difference between these transfers and 1080p HD: strong contrast and deep blacks underpin sharp and colorful imagery: the odd bits of noise or softness or graininess are very much the exceptions to well-resolved and textured picture quality. The audio situation is similar, in lossy DTS-HD High Resolution 5.1 surround mixes that most will find indistinguishable from a lossless equivalent. Dynamic special effects and bombastic music get their due, though they never wash out the always clear dialogue, and surround placement is exemplary, with some very nice ambient effects contributing to a soundfield of wraparound immersion. Disc One bonus features include "A Christmas Carol Confidential" (56:04, HD), “Comic Relief Sketch ‘Space’” (3:58, HD) and “Comic Relief Sketch ‘Time’” (3:03, HD). Disc Two moves along to an audio commentary on “The Impossible Astronaut” with producer Marcus Wilson, line producer David Mason and actor Arthur Darvill, along with the video extras “Monster File – The Silence” (10:58, HD) with director Toby Haynes, Alex Kingston, Arthur Darvill, Karen Gillan, head writer Steven Moffat, Silent performer Iestyn Hampson Jones, Mark Sheppard; “Episode 1 Prequel” (1:43, HD) and “Episode 3 Prequel” (1:26, HD). Disc Three offers audio commentary on “The Doctor’s Wife” with writer Neil Gaiman and audio commentary on “The Rebel Flesh” with director Julian Simpson and actors Marshall Lancaster (Buzzer) and Mark Bonnar (Jimmy), along with "Monster File – The Gangers" (13:02, HD) and the Night and The Doctor featurettes “Bad Night” (3:40, HD), “Good Night” (4:53, HD), “First Night” (2:17, HD) and “Last Night” (3:34, HD). Disc 4 kicks off with audio commentary on “A Good Man Goes to War” with Darvill and Neve McIntosh (Madame Vastra) and effects supervisor Tim Barter and proceeds to "Monster File – The Anti-Bodies" (9:04, HD), "Episode 7 Prequel" (1:38, HD) and "Episode 8 Prequel" (1:57, HD). Disc Five includes audio commentary on “ The Wedding of River Song” with head writer/executive producer Stephen Moffat, director Jeremy Webb and actress Frances Barber (The Eye Patch Lady/Madame Kovarian), "Monster File – The Cybermats" (10:15, HD), "Episode 13 Prequel" (1:13, HD), "Night and The Doctor 'Up All Night'” (1:56, HD), "Part 1 Trailer" (1:08, SD) and "Part 2 Trailer" (:48, SD). Disc Six wraps up with fourteen installments of Doctor Who Confidential: "Episode 1 – Coming to America" (14:18, HD), "Episode 2 – Breaking the Silence" (11:32, HD), "Episode 3 – Ship Ahoy!" (12:23, HD), "Episode 4 – Bigger on the Inside" (12:31, HD), "Episode 5 — Double Trouble" (14:22, HD), "Episode 6 – Take Two" (12:17, HD), "Episode 7 – The Born Identity" (9:19, HD), "Episode 8 – River Runs Wild" (12:59, HD), "Episode 9 – About a Boy" (13:50, HD), "Episode 10 – What Dreams May Come" (11:22, HD), "Episode 11 – Heartbreak Hotel" (9:17, HD), "Episode 12 – Open All Hours" (12:58, HD), "Episode 13 – When Time Froze" (9:12, HD) and "The Nights’ Tale Confidential" (15:24, HD). All site content © 2000-2019 Peter Canavese. Page generated at 04/24/2019 01:13:54PM.